Epsom is a market town in Surrey, England, 13.7 miles (22.0 km) south-west of London, between Ashtead and Ewell. The town straddles chalk downland (Epsom Downs) and the upper Thanet Formation. Epsom Downs Racecourse holds The Derby, now a generic name for sports competitions in English-speaking countries. The town also gives its name to Epsom salts, extracted from mineral waters there. 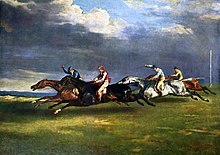 Within the centuries-old boundaries is Epsom Downs Racecourse which features two of the five English Classic horse races; The Derby and The Oaks, which were first run in 1780 and 1779 respectively. On 4 June 1913, Emily Davison, a militant women's suffrage activist, stepped in front of King George V's horse running in the Derby, sustaining fatal injuries.